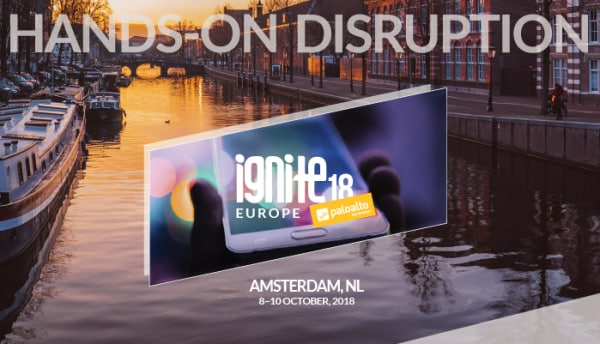 Ignite Europe is just around the corner. With over 100 sessions, a variety of hands-on workshops and countless opportunities for peer-to-peer networking, many wonder what to focus on and how to make the most of their experience. Here are some ways to maximize your time at the conference. Whether you’re a partner, a cloud architect or a business executive, you can tailor your agenda to suit your needs. Our session builder makes it simple for you to build your own schedule, whether you’re looking for a roundtable discussion on IoT, a technical session on container security, or an overview of how you can implement Palo Alto Networks products in the era of GDPR. We believe in learning by doing and experiencing our technology in action. Palo Alto Networks is offering thousands of seats throughout the conference to see how our products and services work against the most sophisticated threats. Sign up for Hands-On Workshops, Ultimate Test Drives, Cyber Ranges, and more. We also encourage you to secure your seat in advance to take the PCNSE accreditation exam at this year’s Ignite. You can learn more about Beacon beforehand here. Additionally, our own product experts will be available to share ideas and answer any questions you have. You can learn more about the conference and what to expect here. I look forward to seeing you in Amsterdam. The post Maximizing Your Time at Ignite Europe 2018 appeared first on Palo Alto Networks Blog.